(Reuters) - NATO's top official accused Moscow outright on Thursday of attacking Ukraine as allied leaders gathered for a summit to buttress support for Kiev and bolster defences against a Russia they now see as hostile for the first time since the Cold War. U.S. President Barack Obama and his 27 allies meeting at a golf resort in Wales will also discuss how to tackle the Islamic State straddling parts of Iraq and Syria, which has emerged as a new threat on the alliance's southern flank, and how to stabilise Afghanistan when NATO forces leave at year's end. 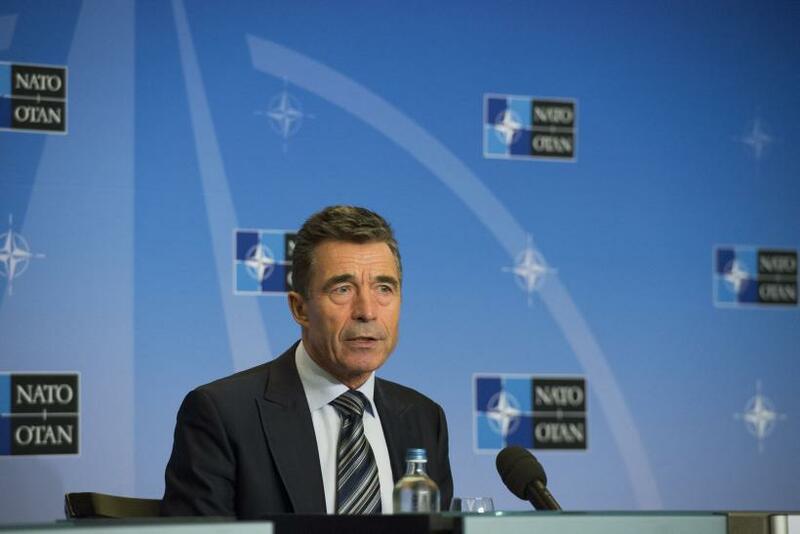 "We are faced with a dramatically changed security environment," NATO Secretary-General Anders Fogh Rasmussen told reporters on arrival at the summit. "To the east, Russia is attacking Ukraine." His statement stepped up Western rhetoric against Moscow and set the tone for a two-day meeting marked by a return to east-west confrontation 25 years after the fall of the Berlin Wall. Moscow denies it has troops in Ukraine but NATO says more than 1,000 Russian soldiers are operating in the country. Rasmussen also said NATO allies would consider seriously any request from Iraq for assistance in dealing with the growing insurgency by Sunni militants. British Prime Minister David Cameron, the summit's host, said pressure on Moscow would mount if it did not curtail military action which he branded unacceptable. "What Russia needs to understand is if they continue with this approach in Ukraine, this pressure will be ramped up," Cameron told BBC television, adding that U.S. and EU sanctions were already having an effect on the Russian economy. Ukrainian President Petro Poroshenko, whose forces have suffered a string of setbacks at the hands of Russian-backed separatists in the south and east of the country since last week, was to meet Obama and the leaders of Britain, France, Germany and Italy just before the summit starts. The Ukrainian leader is looking for arms, training and intelligence support for his armed forces as well as political support against Russian President Vladimir Putin. However, his talk of reviving Ukraine's bid to join the U.S.-led military alliance could reopen a rift within NATO. Were Ukraine to join NATO, alliance members would be obliged to defend it with arms. As it is not a member, they have made clear they will not fight to protect it, but are taking mainly economic measures - U.S. and EU sanctions - against Russia. Obama said in Estonia on Wednesday the door to membership would remain open to states that meet NATO standards and "can make meaningful contributions to allied security", but France and Germany remain opposed to admitting Kiev. A French official said NATO should contribute to easing tensions, not exacerbating them. Russian Foreign Minister Sergei Lavrov underlined Moscow's opposition to Ukraine joining NATO, warning that attempts to end the country's non-aligned status could "derail all efforts aimed at initiating a dialogue with the aim of ensuring national security". After a week of defiant statements from Putin, Lavrov said Russia was ready for practical steps to de-escalate the crisis in Ukraine and urged Kiev and the rebels to heed ceasefire proposals put forward by Moscow on Wednesday. Asked about Putin's plan, Rasmussen said NATO welcomed efforts to find a peaceful solution but "what counts is what is actually happening on the ground and we are still witnessing, unfortunately, Russian involvement in destabilising the situation in eastern Ukraine". As more than a decade of NATO-led combat operations in Afghanistan draws to a close at year's end, the 28-nation, U.S.-led military alliance is refocusing in part on its core task of defending its territory. NATO leaders will set up a "spearhead" rapid reaction force, potentially including several thousand troops, that could be sent to a hotspot in as little as two days, officials say. Eastern European NATO members, including Poland, have appealed to NATO to permanently station thousands of troops on their territory to deter any possible Russian attack. But NATO members have spurned that idea, partly because of the expense and partly because they do not want to break a 1997 agreement with Russia under which NATO committed not to permanently station significant combat forces in the east. Instead, leaders will agree to pre-position equipment and supplies, such as fuel and ammunition, in eastern European countries with bases ready to receive the NATO rapid reaction force if needed. NATO has said it has no plans to intervene militarily in Ukraine. It has focussed on beefing up the defences of former Soviet bloc eastern European countries that joined the alliance in the last 15 years. The Baltic states Latvia, Lithuania and Estonia, the only parts of the former Soviet Union itself to be admitted to NATO, fear Moscow could meddle in their affairs with the same rationale it applied in Ukraine - protecting Russians. In an article in The Times newspaper on Thursday, Obama and British Prime Minister David Cameron wrote: "To the east, Russia has ripped up the rulebook with its illegal, self-declared annexation of Crimea and its troops on Ukrainian soil threatening and undermining a sovereign nation state. "To the South, there is an arc of instability that spreads from North Africa and the Sahel, to the Middle East." So far, Western military gestures of support for Ukraine have been mostly symbolic. NATO leaders are expected to approve a package of support for Kiev, setting up trust funds worth around 12 million euros (9.5 million pounds) to improve Ukrainian military capabilities in areas such as logistics, command and control and cyber defence. A dozen countries will join an exercise in Lviv, Ukraine, later this month, co-hosted by Ukraine and the U.S. Army. NATO officials say the alliance itself will not send the weapons that Ukraine is looking for but individual allies could do so if they wish. NATO leaders will discuss the alliance's relationship with Russia, which officials say has been fundamentally changed. After the end of the Cold War, NATO and Russia sought cooperation in some security fields but NATO has concluded that this effort has failed, and for now at least, Russia is not a partner, a senior alliance official said. "Russia has basically violated very fundamental agreements on the basis of which we have constructed peace and security in Europe for the last two decades," the official, speaking on condition of anonymity, said. NATO has already suspended cooperation with Moscow following its annexation of Ukraine's Crimea region. France, which has faced fierce pressure from Washington and other NATO allies to halt the sale of two helicopter carriers to Russia, said on Wednesday it would not deliver the first of the warships for now because of Moscow's actions in Ukraine. What NATO leaders will agree to do to help Iraq combat Islamic State militants is less clear. The alliance as a whole is highly unlikely to follow the U.S. lead in staging military strikes on Islamic State, NATO diplomats say, although individual allies such as France and Britain may do so. NATO could revive a mission to help train the Iraqi armed forces that it halted in 2011, diplomats say. What Will NATO Decide At Its Summit Over Ukraine?